URGENT: Letter-Writing Action: Stop Sweden’s Illegal Deportation of Ahwazi Activist Ali Mansouri! UPDATE: FANTASTIC NEWS: Ali Mansouri’s deportation was halted by an amazing act of international solidarity. Please see here for a summary of what occurred. Dear friends: Ali’s illegal deportation by the government of Sweden is scheduled for Friday, 26 August 2011. We have learned that the Swedish government has already bought his tickets and his flight will go directly to Imam Khomeini airport. There is no time to lose. The Swedish government demonstrates once again, despite its illegality, that it is determined to send an Iranian activist to detention, torture, and possible execution. We have pushed the Swedish government back many times now, and working together, we will do it again for dear Ali Mansouri. Please URGENTLY use this as a sample letter to send your own letter of complaint to the Swedish government; relevant email addresses are below. Ali was born on 2 February 1983 in Ahwaz. As an Arab Iranian, he is a member of an ethnic group that has faced centuries of discrimination and neglect in Iran, including massacres sustained under the Islamic Republic regime that have been of such large proportion that they should constitute crimes against humanity. Atrocities and organized crimes against Arabs of Khuzistan have continued under the Islamic Republic until the present day. In addition to being a member of a persecuted minority in Iran, he is also a member and an activist of an organization called the Republic of the Arab Nation of Ahwaz. He was among those who rioted in the impoverished Arab shantytowns in April 2005 against the regime’s plans to manipulate the ethnic composition of Khuzistan to facilitate repression of Arab Iranians. Ali was arrested at the end of the summer of 2005 by the plainclothes agents of then-President Khatami’s Ministry of Intelligence. His computer and scanner, which he used to print and disseminate flyers and anti-Islamic regime literature were discovered and confiscated. « No One Should Be Able To Say “We Did Not Know”! People who will lose their life and future will leave their own home for a sanctuary. If you don’t understand it,we do. Please let him stay or let him travel to a human nation which would save his life and future. Unless you want people to be killed in these last days of the regime in Iran,only because they know their time is up. Please stop these deportations, and work with the Secretary of State Mr.Clinton for arrangements. She is on the human Rights side. This is not fare at all. This is against humanity and human rights. I am asking Sweden’s government to Stop and reconsider this actions. Sending innocent peoples to death or torture is not what Swedish people desire! You speak of human rights. To make it work? Stop disporting Ali, Iran is not a safe country, do not play with people’s lives because of your benefits, Ali could be executed like others. DON’T DEPORT ALI MANSOURI TO IRAN UNLESS YOU DON’T CARE OF HUMAN RIGHTS. 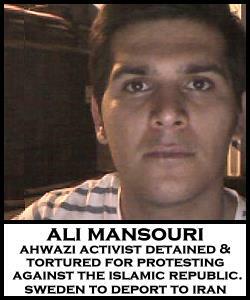 Please stop deporting Ali Mansouri the Ahwazi Activist! respecting human rights. STOP DEPORTING ALI MANSOURI, if are you human !!!!! Why Sweden has started this kind of behavior ??? Stop playing with peoples lives , at least hold him on temporary basis !! please stop deporting ali mansoori to fashist eslamic republic of iran! This is against humanity and human rights specially when you know how the Islamic regime of Iran is handling the peaceful oppositions. please do not deport Ali Mansouri or any opposition to Iran .Give them at least a chance to go in some other country. Es ist schön peinlich , das ein Asyl bewerber , abgeschoben werden konenn !! Nieder mit der Islamischen Republik ! non deportare mai e consegnare oppositori al regime iraniano . از دولت سوئد خواهشمندم خودداری از این عمل نادرست که میتواند جان یک انسان را در معرض خطر قرار دهد،بکند و خود را همراه با اینگونه رژیمها که یکی پس از دیگری سرنگون میشوند،نکند تا در فردای ایران شرمنده این ملت غیور نشود. تندرستی را برای همه آن کسانی که بد هم را نمیخواهند با تمام علاقه خواستارم. This action of Sweden is heinous and inhuman. Stop deporting political refugees to the barbaric government of Iran.